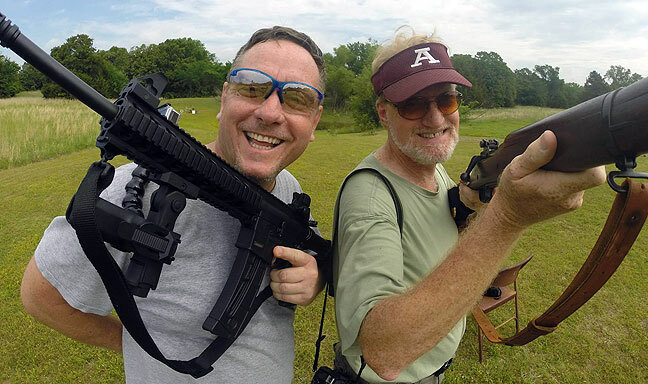 Scott Andersen, left, and I pose for a photo at my shooting range yesterday morning. I am holding a Springfield 03a3, and Scott has my Smith and Wesson M&P 15/22, which he decided, correctly, is the most fun firearm ever made. Abby and Scott pose for a photo at Papa Gjorgjo restaurant Friday night. Feeling like continuing the celebration, we then went to Braum’s, an Oklahoma favorite, for ice cream. Long-time friend Scott Andersen came to visit this weekend. We hadn’t actually laid eyes on each other in nearly 20 years, but it seems like we picked up right where we left off. 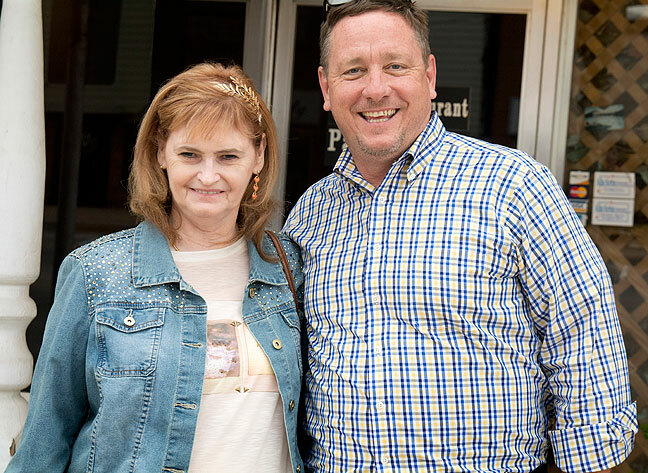 My wife Abby had never met Scott and wanted to take him to dinner, so we dined at Papa Gjorgjo, the Italian restaurant in downtown Ada where Abby and I had our first date. Later, in private, both Abby and Scott said they liked each other. On Saturday morning, we got some breakfast, then hit the range for some target shooting and some tactical drills. In recent years, Scott has gotten into GoPro photography, so part of the fun was making video of our experience from four angles at once. Later in the morning, Scott designated my range the “The Barron Wasteland Range of Fury” as a place on Facebook. When Scott returns to his home in Georgia and edits and posts the video we made, I’ll share it here. 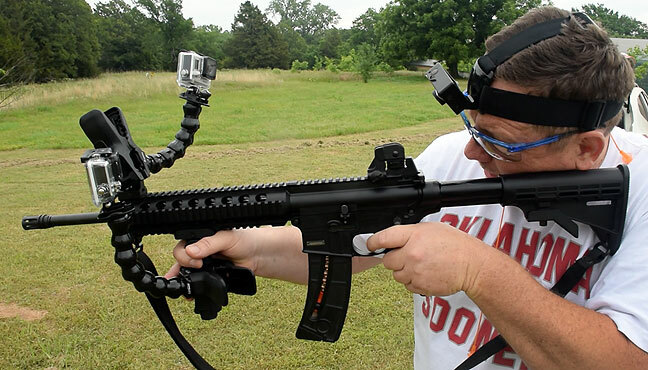 Scott and I loaded my S&W M&P 15/22 with two GoPro cameras, plus one on Scott’s head, plus the one that made this image. Watch this space for the result soon. At one point Scott asked me, almost incredulously, “So, are you happy?” Of course I answered without hesitation, “Yes.” Scott might have been hesitant in asking me this because he knew me best during a very unhappy time in my life, and although he has been in touch with me in recent hears, he’s never seen me with Abby, who is probably the biggest reason I am so happy. 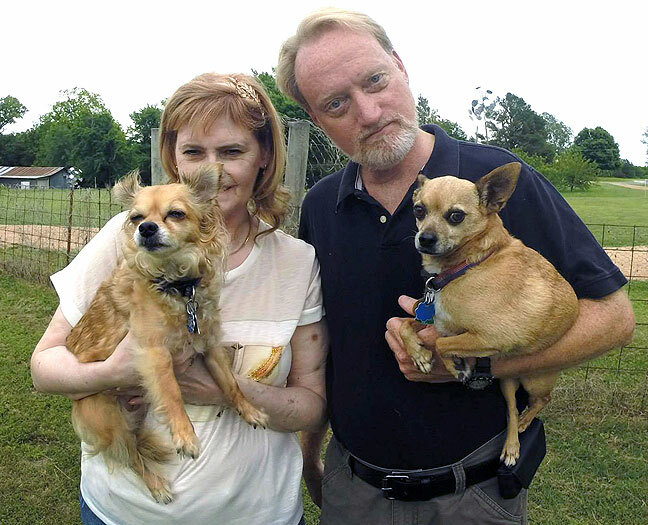 Abby and I posed with our Chihuahuas, Sierra and Max, in the front yard for Scott’s GoPro cameras. When we were out about town, people kept saying hello to me, calling me by name, telling me how much they liked this picture or that in the newspaper, or just that they like my pictures. At one point Scott asked me, “How much did you pay these people to pretend they know you?” But of course, another reason I’m so happy is my relationship with my community, and I can’t remember the last time I was in a public place here and no one recognized me. Scott got a huge kick out of staying in our RV, the Kokopelli. He was excited about it the moment he saw it, and said he got a great night of sleep in it. Read Scott’s blog entry about the weekend here. 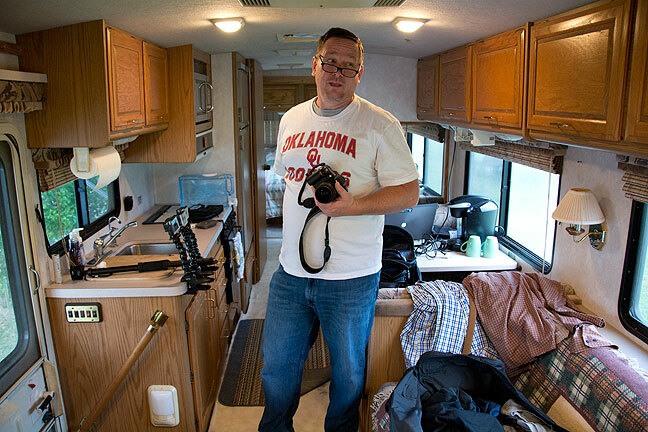 He broke camp about 3 pm Saturday to drive back to the Dallas-Fort Worth area to use his GoPro cameras to record a concert by Brave Combo, a band he and Robert have followed and loved for 22 years. Scott and I had a great time, and I hope we can get together again soon. Scott gathers his gear in our RV, the Kokopelli, prior to our shooting adventures at the Barron Wasteland Range of Fury Saturday. Places similar to the Barron Wasteland Range of Fury include, H2O Church and Vintage 22 of Ada, Oklahoma.